Some presentations of the conference talks are available, as well as some photos taken by the participants. The conference is organized by the Institute of Mathematics of Polish Academy of Sciences (IMPAN) and the Institute of Mathematics of the University of Warsaw, within the program of Banach Center Conferences of the Stefan Banach International Mathematical Center. 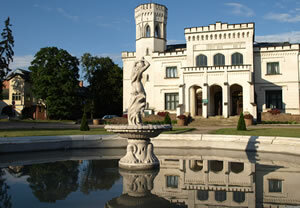 It is held in the Mathematical Research and Conference Center in Będlewo, Poland. The Conference Center in Będlewo is located 26 km from the centre of Poznań, among forests and lakes of the National Park of Wielkopolska. The topics of the conference include one-dimensional real and complex dynamics, thermodynamical formalism, fractals, invariant measures and entropy. During the conference we would like to celebrate the 60th birthday of Prof. Feliks Przytycki, who is one of the leaders of Dynamical Systems in Poland for over 30 years. The conference starts on Monday morning 23 April 2012 and ends on Friday 27 April 2012 after lunch. The conference fee is 700 PLN (approx. 170 EUR at current rates). It includes full accommodation in the Conference Center in Będlewo from Sunday evening 22 April 2012 to Friday afternoon 27 April 2012 (with optional extension for Friday/Saturday night 27/28 April), a conference dinner on Wednesday 25 April and a bus from/to Poznań to/from the Conference Center.